POWER SPOT--(POW er spot); a natural site where humans go in times of stress to find comfort in the contemplation of something larger, greater, or more important than themselves. Solitude. Other words to substitute here might be tranquility or peacefulness. Elevation. Power spots are always higher than their surroundings. Panorama. There must be at least a 180 degree view, preferably 360. Natural beauty. Think "scenic overlook" without road access or traffic noise. If Arizona, with its deep canyons and its stark mountains, doesn't lead the nation in power spots, it surely deserves a prominent place in the conversation despite its dearth of water and lack of coastline. "Going to the mountaintop" has biblical connotations, but I'm guessing every calendar day finds a confirmed atheist and an evolutionary scientist at some high place in Arizona, though probably not together at the same time or at the same site. It is mid-October. 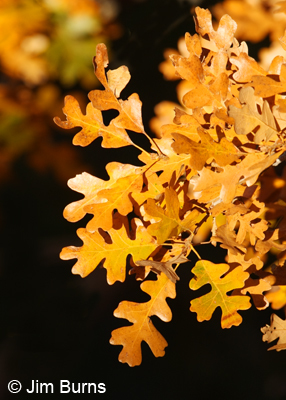 The oak growing up from the cliff face below me has turned to burnished gold and the sumac on the far slope behind it is a blood red splotch. The Red-tail rises up, unannounced, above and behind the oak from somewhere in the drainage thousands of feet below, riding a thermal created by the intersection of morning's east wind with cliff's spectacular east facing rock walls, its unmistakable buteo form kiting on the updraft, wavering without wingbeats, head lowered as it searches for prey far below. This is a classic Red-tail. 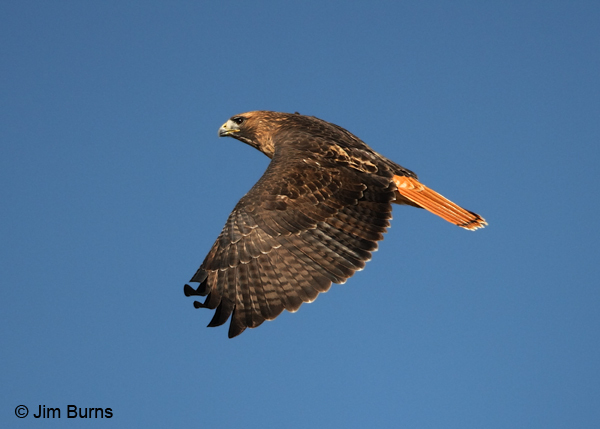 The hawk is a fully adult bird appearing to have borrowed from oak and sumac, perfectly mixing their palette of fall colors to paint the bright, burnt orange tail feathers which are the signature fieldmark of its species. Conventional wisdom holds that early October is the peak of southbound raptor migration through Arizona. I know we are a little late. Evidence came yesterday at a different site in central Arizona where a friend once recorded 74 raptors in a single day, yet we saw only 14, two of them Golden Eagles flying north, probably locals rather than migrants. Today, another typical magic fall day in Arizona--warm afternoons, cool nights, perfect blue skies--we are destined to see only six. But here on Aztec Peak that's alright because the setting, the views, and autumn's radiant raiment conspire to make the hawk watching almost incidental. Terrain and weather, in that order, are everything to southbound raptors. Conserving energy, as all but one of an intelligent creator's creatures have evolved to do, migrating raptors will follow coastlines and ridgelines where rising midday thermals afford them easy passage, soaring without constant wingbeats. A soaring raptor is not a requisite for a true power spot, but it certainly adds to the effect. The other five hawks we have seen today were accipiters, Sharp-shinned and Cooper's, passing quickly as accipiters are wont to do, flap, flap, glide . . . flap, flap, glide, undulating, tumbling across the void, on a mission, hurtling southward with great haste. This Red-tail classic, though, is hunting or playing, perhaps a local who just happens to be riding the currents along the east face of Aztec's overlook. There is no sound but the soughing of the wind through the pines behind us, we are at almost 7700 feet with a 220 degree view to the east and southeast, and directly below, way below, is the deep gash that Cherry Creek has cut into the Sierra Ancha range. From this flank of Aztec we are overlooking the Sierra Ancha Wilderness Area and, farther off, the awesome canyons of the Salt River itself. Yes, Aztec Peak qualifies as a power spot and, probably because we have never been here before, I now declare it unarguably my favorite Arizona power spot. Scrambling over the lip along rock ledges that lead downward to a small shelf among trees stunted from the thin soil and constant winds, I discover someone before me has found it special too. Tucked beneath a small oak growing up from a wall of rock is a tiny cairn. Atop the cairn is a cross with a photo and a poem, laminated against the harsh elements of this high, isolated peak, and flowers that appear recently fresh. This too is not a requisite for a true power spot, but this too certainly adds to the effect. Though the morning sun is directly on my back and the wind is not a cold one, I shiver involuntarily and glance around. The hawk has moved on, but two passing ravens speak to one another and a chipmunk scurries into a crevice. There are no human eyes upon me. There may or may not be ashes beneath the cairn. Careful not to disturb the memorial in any way, I crawl beneath the oak and read the poem. It is someone's father . . . or son or brother. It would appear whoever brought the flowers does so periodically. Was it his power spot, or is it theirs? My wife and I have had this debate. Assuming each has a different favorite, do the ashes belong at the deceased's power spot or at that of the loved one left behind? Our resolution to this conundrum is to leave some at both. Somewhere on the mountain above me a Steller's Jay is chattering, and a flock of Western Bluebirds passes overhead. My reverie broken, I scramble back to the top of the overlook and walk toward our campsite, my thoughts now caught up in the breaking details of the so-called "sweat lodge" deaths here in Arizona. They occurred at a personal improvement retreat near the spectacular red rocks resort/retirement community of Sedona. Years ago I spent a birthday at a power spot above Oak Creek near Sedona. I recall a flock of Cedar Waxwings coming to a bush there, laden with ripening berries. Perhaps birds are a requisite for power spots. Or certainly their being at one enhances the chances of recalling it. But would it be a power spot if you paid $9685 to be there with a "personal improvement" guru and a couple dozen other people for a "Spiritual Warrior" event, the finale involving all participants, fasting, crammed into pitch dark sweat lodge listening to guru's motivational aphorisms while being encouraged not to leave no matter how many around you began feeling faint, nauseous, or short of breath. "Connecting with a higher power" this guru called it, and three of his participants surely did make that connection. They died. Can you say "law suit?" There is now a whole industry built up around this type of "spiritual tourism," and a professor at Arizona State University who does research on the surging popularity of personal improvement events like this, asked about the sweat lodge deaths, is quoted as saying "There's a tendency to go to places that have a Mother Earth power." It all sounds good, something akin to visiting a power spot, but those two words, "power spot," do not come to mind in regard to this incident. "Greed," "arrogance," and "stupidity" do, and if you need two words try "personality cult." Perhaps spiritual warriors just need to go birding. By themselves. In solitude. In high, lonesome places. There's probably a reason great cathedrals have vaulted ceilings, stained glass windows, and attendees speak in hushed tones. Aztec Peak in its autumn splendor would seem to qualify for cathedral designation. Hawk watch sites are natural cathedrals, cathedrals without the human "artifice," a word carrying that secondary connotation which drives many away from organized religion. If you should find yourself in need of spiritual refreshment next early October and you'd like to combine spiritual tourism, a trip to a power spot, with a little birding, try one of these sites--Miller or Carr Peak or Montezuma Pass in the Huachucas, Kitt Peak in the Baboquivaris, Pinal Peak south of Globe, or any number of isolated points on the South Rim of the Grand Canyon. Leave your checkbook at home, take your bible--The Sibley Guide To Birds, and binoculars, and pray for raptors. Even if no hawks are about, you'll be better for the time spent by yourself in the solitude of Arizona's awe inspiring high country. Power spots, like the birds which often frequent them, bring refreshment to the soul.